A 26-Letter Pop Culture Puzzle! Well, it’s our last post of 2017, and I thought we’d close out the year with a puzzle. 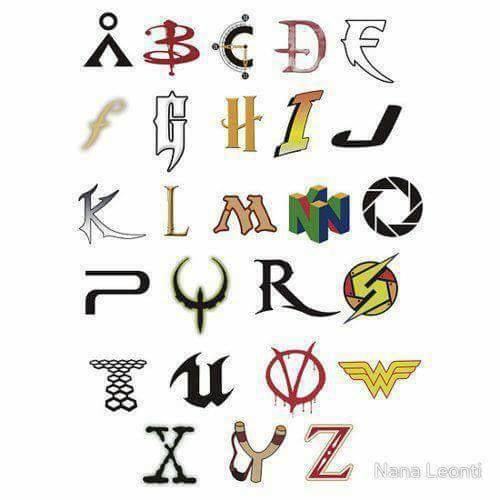 Can you puzzle out the sources behind this alphabet composed of pop culture icons and fonts? Let us know how many you got, or if any left you stumped! We’d love to hear from you! And if we don’t hear from you before then, Happy New Year! This entry was posted in PuzzleNation, Puzzles and tagged alphabet game, Brain teaser, DIY puzzling, font, games, Geeking Out, Holidays, letter game, logo, Pop culture, Puzzle to solve, PuzzleNation, Puzzlin' fool, Wordplay by gmdirect. Bookmark the permalink. How many did you get? I can fill in the blanks for you.